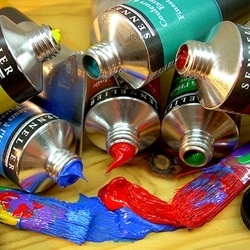 These premier artists' oil paints are made from only the highest quality traditional and modern pigments ground extra fine. Pure, first-press safflower oil is used for unsurpassed clarity and resistance to yellowing. They have a unique non-glossy "French" satin finish that is more natural looking than other oil colors. Sennelier also makes one of a kind colors such as transparent Sennelier brown, Chinese orange, semi-opaque mars colors, and the unusual cinnabar and cobalt greens.